The Mohawk Landings View Engineered Hardwood Flooring Collection features gorgeous 3/8 in. thick engineered hardwood products. This collection showcases a distressed texture which adds character and charm to the rich color tones. The multi-joint locking system provides quick and easy installation while the random length planks ensure a more genuine appearance. The Landings View Collection contains a top coat finish for increased surface protection. Made with the highest standards in manufacturing, achieving unmatched quality and detail in every plank, the Monument collection is sure to add quality to your home. This Mohawk flooring meets all environmental standards and is CARB II and Lacey Act compliant. California residents: See Proposition 65 Information. 28.25 sq. ft. per case and case weight: 43 lbs. Buy online Mohawk Landings View Sienna 3/8 in. Thick x 5 in. 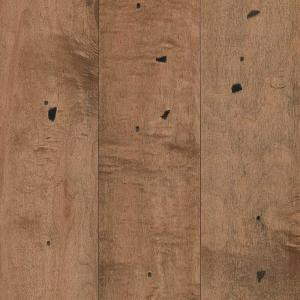 Wide x Random Length Engineered Hardwood Flooring (28.25 sq. ft. / case) HEC56-14, leave review and share Your friends.